Safarilink Aviation has a spanking new terminal at Wilson Airport, which is located adjacent to the departure area, with a lovely seating area and coffee shop run by Monikos Restaurant. Flights to the Mara take off at 10 am and 3 pm every day, and on a cold, grey Friday in June, we flew out to the Mara on a morning flight at 10 am. Our flying time was about 45 minutes, in a twin Otter with 2 pilots, very smooth, touching down at the airstrip in Naboisho Conservancy, Mara at around 11 am, right on schedule. We were received at the airstrip by Manfred, our driver/guide from Basecamp Eagle View, who cut a fine figure in his Maasai shukas and jewellery. We set off on our first game drive, en route to the Camp which is about an hour’s drive away. Driving along in the Naboisho Conservancy is a refreshing change from the main Mara Reserve as you don’t see the congregation of vehicles and large cattle herds that you would probably see in the main Mara Reserve. 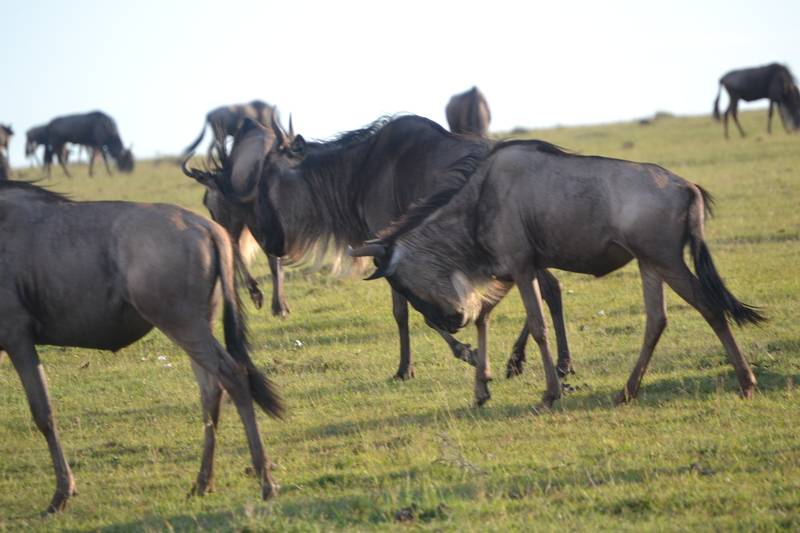 Instead we saw huge numbers of wildebeest, left behind from the migration as they had ‘no passports’ to return. The amount of wildlife we saw on this first short game drive was staggering…..wildebeest, topi, eland, Grant gazelle, dikdik, impala, zebra…..it was amazing. Arriving at the Camp, we were greeted by magnificent views over the Conservancy as the Camp sits on a hilltop, facing a salt lick below which is frequented by wildlife throughout the day, providing hours of entertainment for the guests. Our tent was beautifully appointed, with a lovely spacious bathroom, also featuring an outside shower which sadly we could not use, due to the rainy weather. Lunch was set up in the open air dining room, and we were kept entertained by the beautiful birds flitting in and out of the mess area. Jonathan and his able assistant Alfred, served us very well throughout the meal, ensuring that we were well fed. 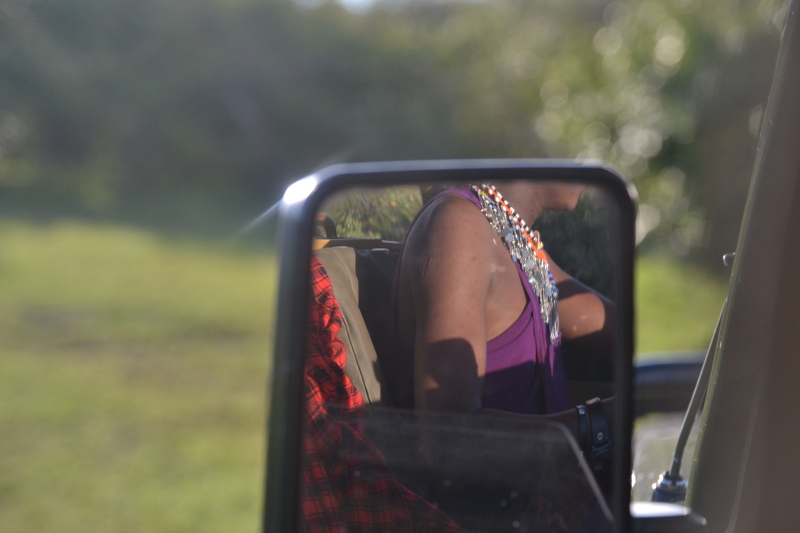 Our evening adventure began with a game drive at 5 pm….we drove through the savanna, past the trees uprooted by the elephants, through the large herds of the resident wildebeest. The grass was short due to the large wildebeest numbers and this was very useful in spotting wildlife. Suddenly Manfred spotted a young male lion under a tree, so well hidden that a few vehicles had just driven past him. Although the lion kept looking towards a herd of gazelles, he didn’t make any move towards them, so after spending some time there, we reluctantly moved on. As the sun was beginning to set, we stopped on the savanna plains for sundowners….crisp, refreshing gin and tonics served with mini pizzas to take the edge of our appetites. It is amazing how quickly one feels hungry out in the bush….didn’t think I could eat a thing after lunch but here I was, ravenous again. We were enjoying the sunset and the drinks so much that we didn’t realize that a group of buffalos was drawing nearer to us, and in fact there were 3 buffalos quite close to us. Our able guides Manfred and Kiok had already spotted them and ushered us back into the vehicle…… time now for a night game drive, which can only be done in Conservancies. This time, we saw a hyena, and three lionesses on the hunt…though we had to leave them to hunt in peace, returning to Camp just in time for dinner. Being escorted to our tent after dinner by the night askaris (guards) was very reassuring, as all around us could be heard noises of animals and the rustling of leaves. I was very glad to get into the warm, welcoming tent and settle down for the night. And what a busy night it was…we had a herd of elephants come through the Camp, there were lions, hippos and hyenas in near proximity to the Camp during the night and we could hear their distinctive noises throughout the early morning hours. The next morning, there was drama at the waterhole as a cheetah was chased away by a group of baboons, spotted by us from the Camp. Our next game drive was in the afternoon of the 2nd day and we saw tons of wildlife including a herd of elephants, and pride of lions with cubs. 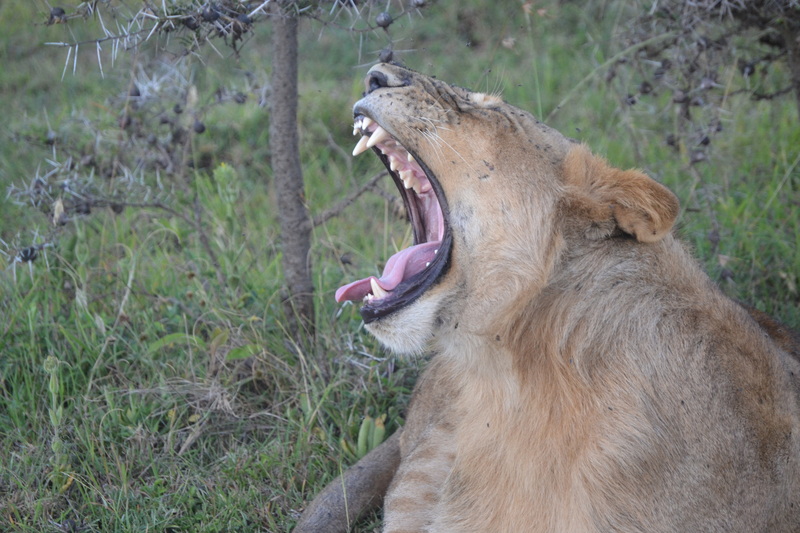 The Naboisho Conservancy is famed for its lion population, similar to that of the Ngorongoro Crater. 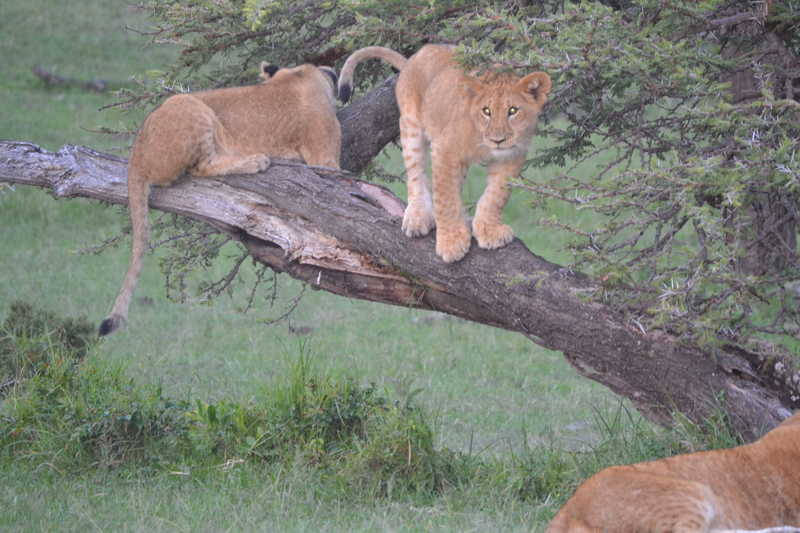 The lion cubs were in a playful mood and we loved watching their antics and rough play. One of the larger male cubs made an attempt to hunt down a wildebeest, but after a thrilling chase, admitted defeat as the the wildebeest was too fast for him. The next morning we set out for a walk in the Conservancy in the early morning. This is a special activity you can only enjoy in the Conservancy and it brings with it a sense of adventure and fun. We were accompanied by 4 Maasai guides, complete with arrows, and Maasai singing and jumping. One of the object of the walk is to educate guests on little known facts about animal footprints, droppings, and useful plants. Fortunately the only animals we came across were the wildebeest, zebra, hyena and hippos in the distance. …no predators though this has happened in the past. 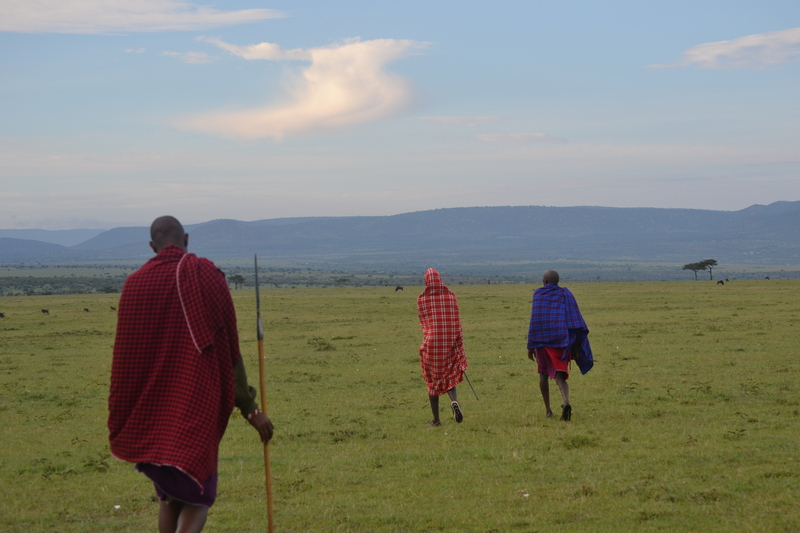 The Maasai walk at a pretty fast pace so one has to be able to keep up with them. A guided walk typically lasts for about 90 minutes to 2 hours, so you are back at Camp in time for a yummy breakfast. Sadly we had to leave for Nairobi that day, so we departed with heavy hearts after breakfast, making our way to the Naboisho airstrip. The airlines flying these routes can make upto 4 landings in the Mara, dropping and picking passengers from different airstrips, so they require that all passengers be at the airstrip at least 30 minutes before the flight departure time, in case of the aircraft arriving earlier than scheduled. 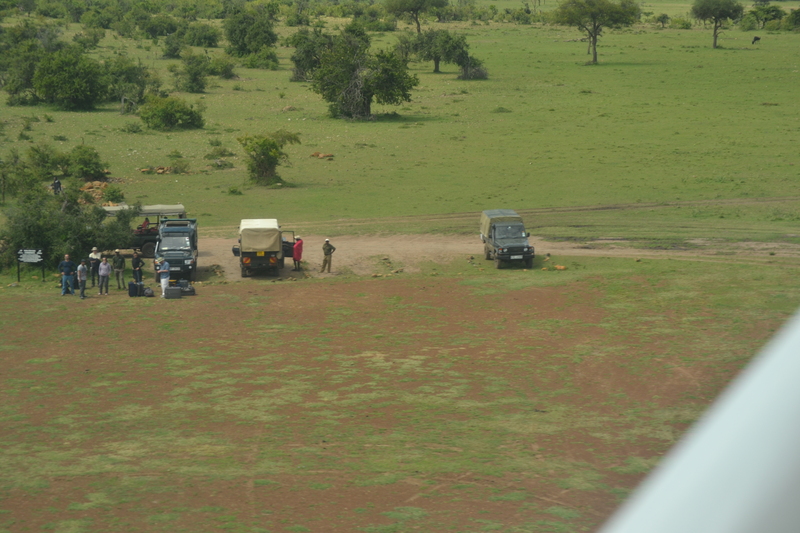 The typical scene at these airstrips will be of vehicles waiting for their passengers either to depart or arrive. Fortunately for us, our flight was on time and this time it was a 35 minute, direct flight to Nairobi…smooth sailing all the way. Landing to the hustle and bustle of Nairobi, the peaceful, natural world of Naboisho seemed eons away.